If The Free Printables Collection and The Inner Genius Collection act like barbells for the mind, The Inner Artist Collection takes things up a notch, adding fun creative expression to the brain boosting mix. With so many school art classes going the way of the dinosaurs, we parents and educators need to find even more ways to sneak creative problem solving into our children’s lives. Enter Art-for-Brains – THE BOOK. Take some engaging cognitive enrichment tools, disguise them as artful playtime, grab some pencils, crayons, markers, and perhaps some scissors, and now you’ve got a whole lot of skill-building fun! Each of five activities in the book targets a specific learning skill. That said, most of the activities have the added benefit of strengthening multiple skills at the same time. Designed to appeal and adapt to multiple ages, Art-for-Brains – THE BOOK is appropriate for most elementary age students in homeschool, traditional classrooms and therapeutic environments. See each of the individual activities below. Finish the Monster Drawing targets visual closure skills, which allow us to recognize complete words rather than only the individual letters or parts. struggle to learn sight words. mix up words that have similar beginnings or endings. have trouble completing a thought or seeing the big picture. Graph Art for Auditory Memory targets our ability to remember what we hear, including our own internal voice while reading. struggle with phonics based instruction. have difficulty recalling names, phone numbers, stories, songs, etc. Dot Grid Pattern Play targets visual figure ground skills, which allow us to distinguish between foreground and background and not become overwhelmed with too many words on a page. often lose their place, either while reading or in written work. have difficulty finding important information in text. are slow to find and copy information from the board. often confuse similar letters such as b, d, p, and q.
struggle with matching, sequencing, or spot the difference activities. Visual Spatial Puzzle Play targets spatial awareness, which helps us understand size, distance, volume, order, and time. It helps us know our left from our right, keeps us from bumping into people (personal space) and lets us know how far to reach across the table to grab that pencil, among other things. write letters too far apart, close together or slanted down the page. struggle with physical directions and easily lose their way from A to B. 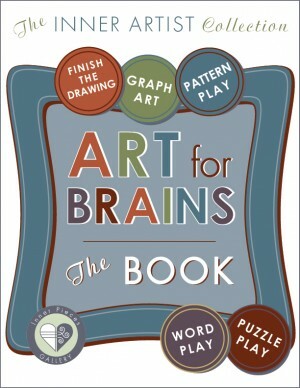 Try each of the five activities individually ($4) or save 25% on Art-for-Brains – THE BOOK, a downloadable, printable e-book that includes everything above.